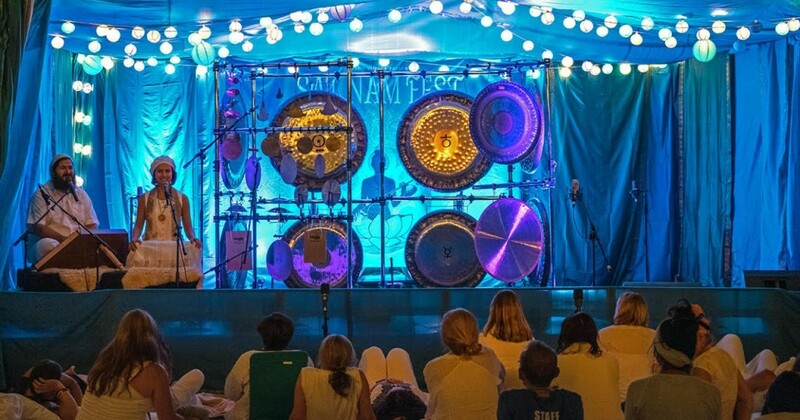 The all-night Gong Bath at Sat Nam Fest is definitely a highlight of the festival for most people. If you haven’t yet had the chance to immerse yourself in it yet, you must! 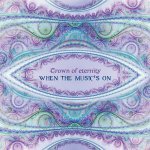 We wanted to know more about the gong’s healing sound vibration and asked Mike Tamburo, one part of the music duo Crown of Eternity, to answer a few questions. SV: How did you first get into the Gong? MT: Like most instruments I end up playing, I felt that there was a need for Gong in a piece of music I was working on. I ended up purchasing a Chinese Chau Gong and a Chinese Wind Gong back in 2004. I was interested in perhaps more of the Pink Floyd style of Gong playing back then, where it was adding a texture or an evolving drone to the music I was writing. I had not thought of it as a solo or even necessarily a meditational instrument at that point. I knew very little about what I was doing then. It was really all about the sound for me. I love long, sustained sounds. I love rumbling, beating interval patterns. I love overtones. I love sounds that really just take the mind to a different space. The Gong is really the perfect instrument for me, although I am also in love with all of the other instruments I play. My focus at the time though was still on stringed instruments – guitar and hammered dulcimer. I ended up going on tour and traveling for the better part of four years after these recordings were made. Those two Gongs ended up living with a friend. Fast forward to after the tour… I ended up returning to Pittsburgh in 2008 where I started delving deeper into the intricacies of the Kundalini yoga practice (which I had discovered during my travels). I met Gallina in a yoga class and before I knew it, we were sharing a romance and soon thereafter a home and life together. We started playing music together and the roots were set for the evolution of our music to where it is now. We were invited to a Healing ceremony led by a Shamaness from Mexico that many of our friends trusted. It was an extremely purging experience for me but when it was over it was like a great reset and clearing. (I have not felt the need to partake since.) A drum was played during the ceremony and it brought me to some painful memories that I had really tried to forget. The drums and the songs were incredibly powerful for me. For some reason, I started thinking about these Gongs that I had given away. Each time I let something negative go, the image of the Gong grew stronger. By the end of the session, it was solidified in me that I had to work with the gong. 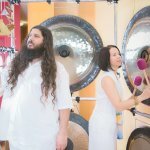 The realization felt kind of mythic to me in my state: “Now is the Changing of the Ages, You have to play the Gong!” I told Gallina after the experience was over that I was supposed to dedicate myself to working with the Gong and that I wanted to go through the Kundalini Yoga teacher training. We purchased a Gong the next day and our lives changed forever. This was a very small Gong and we quickly realized we needed something bigger – hence our collection started building very quickly. Once we had four or five Gongs, we started to really tune in to the interval relationships between the Gongs and the effect it was having on our consciousness. From there, we were hooked and our connection to the Gong and our collection of Gongs really took off. I feel really fortunate that Gallina and I had each other to learn from and that we were able to figure it all out together. We were very open about what the sound was doing to us and also whether or not our playing sounded like something people would want to hear. We certainly did some learning in public (and still do) – especially when it came to volume and space. Still those early sessions were so profound to me. At That point, the Gong definitely was doing the most work on my nervous system and emotional body. It was like I was being rewired and, in the process, just letting go of whatever I had to in order to do this work from a neutral, pure and meditative space. Over time we realized that the Gong was really something different – especially from the other instruments we played. It was something special. More and more people were coming to our events, asking if they could come to our home to hear us play or asking us to bring our Gongs to different places. We felt like universal forces were guiding us and showing us that we really needed the gong and that other people really needed the Gong too. Don Conreaux often talks about getting called to Global Gong Consciousness. That is exactly how it happened to us. The Gong was working on us just as much as it was working on everyone who came for the experience. It became a great service to share our intentions and our vibrations with people. Several hundred sound meditations later, it still feels like great service. SV: What is the role the Gong plays in Kundalini Yoga? The Gong is typically played during Savasana and in some meditations. 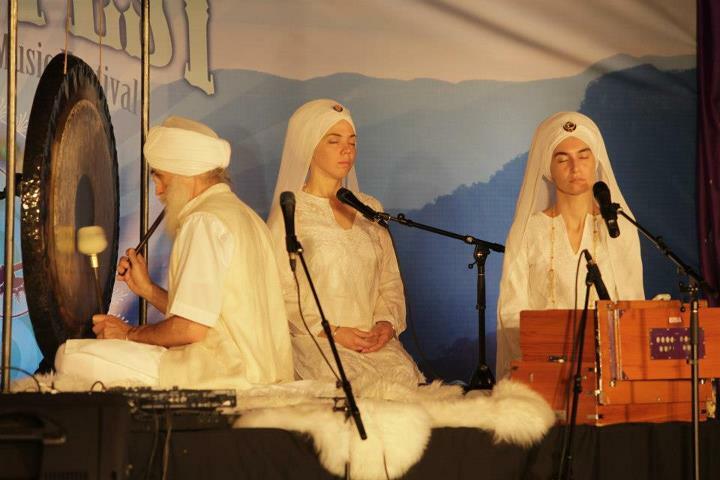 Yogi Bhajan played the Gong with a lot of purpose, intention and understanding of the sound current. He knew how to direct the energy. I think that now the role of the Gong In Kundalini Yoga depends on the teacher and the class that is being taught. I use the Gong for a number of different reasons in my classes and my playing changes according to what I have taught in the class and who is in the class. First and foremost, the Gong shifts consciousness in both the player and the listener. This often means something different every time a mallet is picked up and an intention is set to play the Gong. I find that it helps the exercises and meditations to fully integrate. The Gong can help turn off the mind or push the mind out of the way so deeper states of consciousness can be experienced. Sometimes the Gong allows Savasana to turn into a group journeying experience or, at its best, a group Turiya experience (the state of pure consciousness beyond the three common states of consciousness: waking consciousness, dreaming, and dreamless sleep). It can be a state of deep rest into soul consciousness or it can be really activating, allowing “buried treasures” to be brought up and released from the mind. It can clear the cobwebs from the mind and acts like a nervous system reset button. It can also be used to help facilitate the movement of Prana throughout the body. The Gong almost acts like a Shaktipat Master in those energy moving situations. SV: What are some of the key benefits of the Gong as an instrument of transformation? MT: I always look at this as a range of what I have experienced and what I have seen people I have worked with experience. I find there is a difference between the one-on-one or small group therapy sessions versus the larger group experiences. I only want to relate what I have seen with my own eyes or have heard from people directly with my own ears, rather than relating what I have read. People come to our group sessions with many kinds of intentions and needs. Certainly most people come for some much needed relaxation and stress relief. We also have people who hear the Gong in their Yoga class and simply love the Gong. We have a lot of energy workers who have told us that the Gong clears out their gunk and rebalances their energy. Other people find it very activating for their inner vision and come for the journeying experience. A lot of folks come as a complement to their emotional or therapy work. Many people are looking for physical relief for chronic conditions. For them the vibration expands their awareness beyond their body pain, releases the often complex emotions that go along with chronic disease and allows a much needed depth of rest and rejuvenation as well as openness to new experiences. I personally experience a mixture of energy movement, a mental/emotional clearing or mental journeying, a release from the confines of the physical body, and often a bliss-like Turiya state beyond time and space (depending on the Gong player and the circumstances of the session). Mike plays the Gong during the all night gong bath at Sat Nam Fest. Far more profound experiences happen in the private therapy sessions on all of the levels mentioned above, and more. 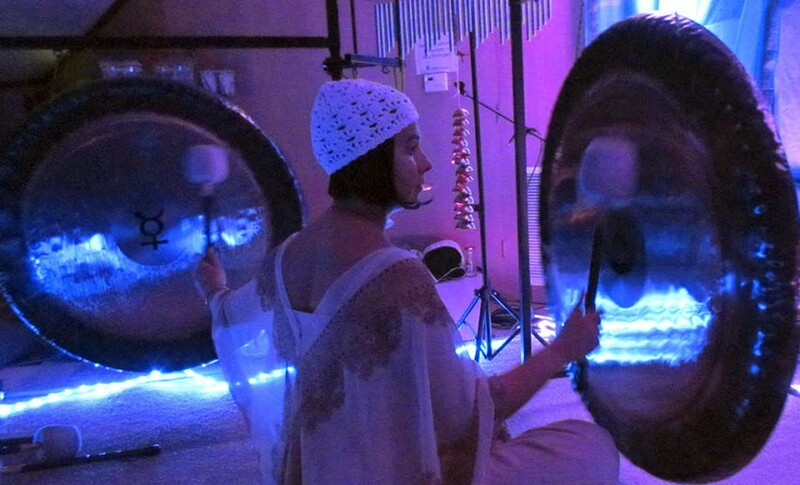 When we do the Gong therapy sessions, we place several Gongs very close to our client’s body. The vibration is very strong, even though we are not playing at a loud volume. We hold the highest of intentions as we are playing the Gongs. Clients have experienced incredible emotional release and integration of trauma, and some have had water based cysts disappear, chronic colon blockages open up (not right in front of us thankfully! ), chronic pain relieved, circulatory problems clear up and so much more. For example, my father has MS. He lost use of his legs in 2000. He was one of my first clients. His leg muscles have atrophied from not moving in so long. They always cause him a level of discomfort. When I position the Gongs close to his legs, his legs gradually change color as if the blood has moved. He has the best night of sleep after a session. Now I am not necessarily saying that the Gong is what is doing the healing. I am a strong believer in the power of intention and also the power of self healing. I feel that the Gong, being a tool of consciousness, takes us to a state where we are able to open ourselves to our healing potential within. Certainly the deep vibrations help this process, but to say that it is only the Gong would be doing this entire practice a disservice. I believe the human body wants to heal itself and the Gong is a tool to get the mind out of the way so healing can take place. We find that the Gong helps activate the parasympathetic nervous system and for some people, this may be the first time in a long time that they are consciously allowing deep relaxation to happen. There are so many problems and so much fatigue that come from not allowing ourselves to relax. Almost daily I hear people say they “can’t” meditate, but with the Gong, they can do so effortlessly. The Gong creates the perfect environment for self healing and self transformation. SV: Why did you start teaching the Gong? 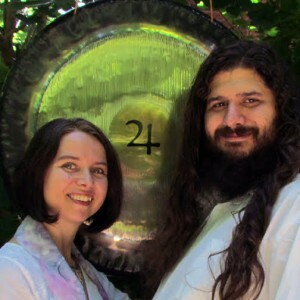 MT: The Gong had such a profound healing effect on both of us. We really wanted to share it with others from the start – first as a therapy and then eventually as something that anyone could play. When I started teaching the Gong in 2010, I was very involved with the music scene and the Yoga community in Pittsburgh. I was teaching Kundalini Yoga at the Yoga Hive in Pittsburgh. The owner wanted to offer other aspects of Yoga than just Asana, so she asked me to teach Kundalini Yoga and another class – something with music or sound and meditation. I had spent time in India and had learned a lot of Nada Yoga meditations. Some of the exercises almost felt like John Cage pieces to me. It was like my listening habits since I was a boy had prepared me for this. It was like we were examining the different spaces within silence. These meditations really had a deep and profound effect on me. I was also practicing Naam Yoga, Vocal Toning, Reiki and some other sound and movement exercises at the time. So I put together a Sound and Meditation course where we explored sound, movement, meditation and relaxation. It was a lovely and unique experience. We experimented with so many ideas of the therapeutic uses of sound in a very non-dogmatic way. I really cut my teeth in that course. We shared our voices, various possibilities with the Gong as a healing tool, Gong playing techniques, singing bowl therapy, vocal toning, mantras, drumming. You name it and we probably tried it. We did around a hundred different classes publicly over a 30 month period. It was a great experiment and I think I learned as much as my students. When I left that studio, I continued the course from my home for about another year. It became a little more focused on the Gong or on singing bowls at that point. During this same time period, we had started traveling with the Gongs doing concerts and workshops in Pennsylvania and an occasional out of state workshop. People had a lot of questions about playing the Gongs – how to play, what to do, etc. As we traveled and performed, we realized that many people had an ingrained fear about playing the Gong. You can’t do this, you can’t do that. If you do this, then this bad thing will happen. You can only play like this. I would ask where this came from, or what would happen, or why. Most people just said that was what they had heard. None of it was from the experience of playing, it was all conjecture. The Gong is about direct experience. As kind of a kismet, over the period of just a few years, Mehtab Benton released his book Gong Yoga on how he was connecting with the Gong and Sheila Whittaker released her book In the Heart of the Gong Space: The Gong as a Spiritual Tool and Sound Healing with Gongs on playing the Gong. Michael Bettine (my favorite Gong Musician) made a Gong Playing video series and I discovered a lot of Don Conreaux’s videos and writings. We were meeting more and more Gong players and everyone was sharing freely. A language for teaching and playing this instrument was developing. Folks seemed to love our concerts and workshops and they started really taking off. Eventually we were being asked to do workshops on playing the Gong specifically. It was all very organic. We had hosted some training courses for Don Conreaux to teach locally here in Pittsburgh and he had us helping quite a bit. He suggested that I teach more – especially a lot of the introductory strokes. We meditated on what we felt was really important for us to share about the Gong and listening and we found ourselves putting together a series of 3 hour to 3 day long workshops. We ended up pulling a lot from what I had already been teaching in the Sound and Meditation course (which no one but a few people from Pittsburgh had experienced) and mixing that with a lot of what we had learned from Don, as well as probably every Gong player we had ever listened to. I started fine tuning the ideas and teachings and our Gong Resonance Therapy course was born. SV: What are some of the right ways to start playing the Gong? MT: This is going to be different from person to person and I think that is perfectly fine. I try not to use words like “right”. One’s relationship with their Gong is very personal and I want to foster respect for that. The Gong is a tool that we are using to affect consciousness and I think treating it accordingly is important. I work with as many Gong players who do not practice Kundalini Yoga as Gong players who do. I think that tuning into the instrument or the room that the instrument is in is very important. How you do this should be something that makes it sacred or special to you. Traditionally in Kundalini Yoga, we tune into the Gong with the mantra Aad Guray Nameh Jugaad Guray Nameh Sat Guray Nameh Siri Guru Devay Nameh Ong Namo Guru Dev Namo Aad Such, Jugaad Such, Hai Bhee Such, Naanak Hosee Bhee Such. Then we open or prime the Gong. There are a number of ways to do this. Gallina plays the Gong during all night gong bath at Sat Nam Fest. After that, for a new player (or even seasoned players), I recommend practicing A LOT. Get used to having a mallet in your hand. Build up some muscle memory. Teach yourself to listen – not only to your Gong, which you should know inside and out, but learn listening in general. Begin to listen to how sound travels in every room that you play your Gong in. Fine tune your ear to room acoustics. Listen to everything that you block out on a daily basis. Make it a meditation, how sensitive can you make your listening experience? Over time, experiment with where you position your Gong – what does it sound like close to a wall or farther from the wall, near a window, turned out to the room? You have to realize that you are not only playing the Gong, you are playing the room. Learn how to breathe while you are playing. Explore ways to enter into and maintain a neutral space when allowing the Gong to transmit with you. Develop a meditative mind. Cultivate a disciplined personal spiritual practice (in any discipline that allows some form of inner work, transformation, and connection). Explore the Gong. Figure out which of the many Gong strokes work for you and understand the energy of those strokes. Learn the tonal points on your Gong and what sounds they make. Experiment to see which mallet brings out which sounds. (I usually have at least 15 mallets with me when I play an hour session). Allow yourself to discover the power of your gong. Learn how to play your Gong so that it sounds good to you. Explore dynamics: how does your Gong sound played quietly, how does it sound played loudly and how does it sound played at half volume. Many Gong players get loud way too quickly and then have nowhere to really go for the rest of the session. (I did this too when I was a young Gonger.) The Gong does not have to be loud to be effective. In fact, I think it is more effective for the player and the listener if you vary the volume and intensity in the session. Allow each session to be unique, while really tuning into the energy of the Gong, the people in the room and your own intention. Experiment with space between strokes. Each time you excite the Gong with a mallet, you are muting or changing the previous stroke. 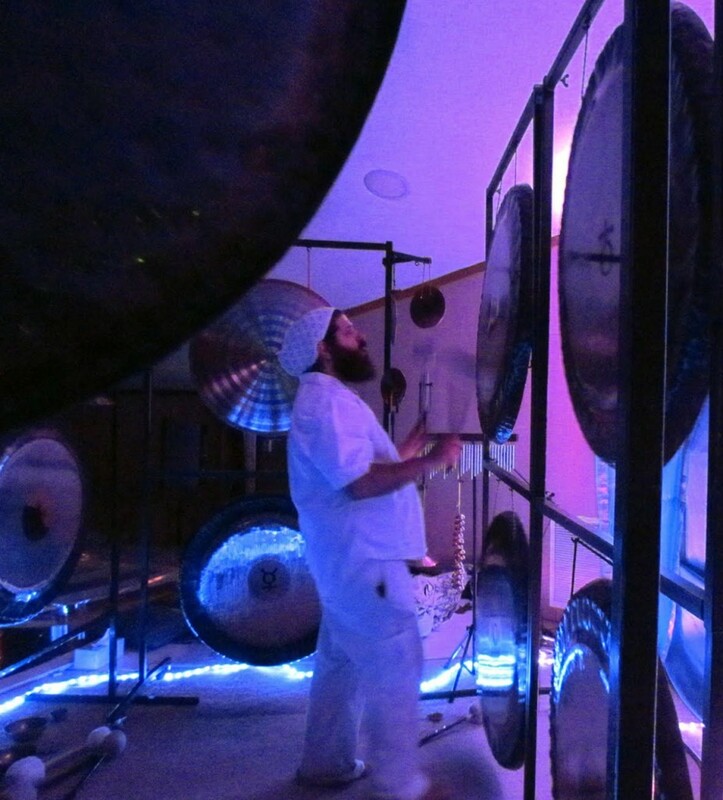 The amount of space you leave allows for different harmonic experiences with the Gong. You do not need to be playing the Gong at 120bpm. Explore the subtle nature of the instrument. Learn how to improvise. Allow silence at the end for integration. Ultimately, develop a personal relationship with your Gong. Don’t rush to play publicly. Give yourself the opportunity to play for friends or family see what kind of experiences they have. When you feel comfortable with that, start taking it to your class or start booking longer sound sessions. SV: What can one expect from your Gong Training? MT: Module One is the Fundamentals – listening, Gong strokes, tonal points, subtlety and dynamics, exploration, silence, getting to know different Gongs and different mallets, possibilities for Savasana, Therapy, and longer Sound Journeys. There are meditations that are geared toward a deeper understanding of the Gong, listening, neutrality and holding space with the Gong. It is all very hands on. We try to create an environment where the course can mold to the group dynamic and evolve accordingly. We usually have 14-20 gongs with us for people to get to know and explore. Module Two is the Practice – It really builds out of the first course. We will explore the tattvas. We will work with directing the sound and coloring the strokes in relation to the elements. We will spend a lot of time examining possibilities for different one on one, private and small group sessions will be explored. We look at the Gong as a tool for energy work. More than anything, we want to impart confidence and empowerment, listening and exploration. We strongly believe that there are infinite ways to play and to receive the Gong. I honestly do not want people to play the Gong like I do, or like Don Conreaux, Michael Bettine or Yogi Bhajan. It is great to be inspired by these people, but the last thing we need to do is clone Gong players. We want to foster each Gongolier’s personal relationship with the sound current. We want them to discover their own creativity with the instrument. We want to free people up to be in the flow while playing. We want to open a space where people will discover their own way of playing and a space where even Gallina and I can be open enough that we can learn from our students as well. You can find more information about Crown of Eternity‘s Gong Training here. Crown of Eternity - Official Music Video for "Wahe Guru Space Choir"